Why September Will Be A "Tale Of Two Halves"
Two weeks after Nomura's Charlie McElligott noted that he was observing "a multi-month performance disaster for US equity funds", as a result of hedge funds getting caught offside by yet another vicious short squeeze, coupled with low net leverage and beta exposure, and insufficient exposure to "momentum" stocks, the cross-asset specialist writes today that as part of the call to get long “Momentum” factor in U.S. Equities (which finished August +9.5%), Hedge Fund Long-Short funds have “grabbed” at market exposure, with the bank's internal metrics showing that L/S funds took up their “Beta to the S&P” to the 100th %ile, in large part thanks to ripping “Momentum Longs”, noting that the "beta to Mo Longs” now 96th %ile, from 44th %ile a week ago." At the same time, the broader Asset Manager category has also been "grabbing" at SPX as expected off the multi-month performance drag, adding a monster +$13.9B of S&P futures last week. 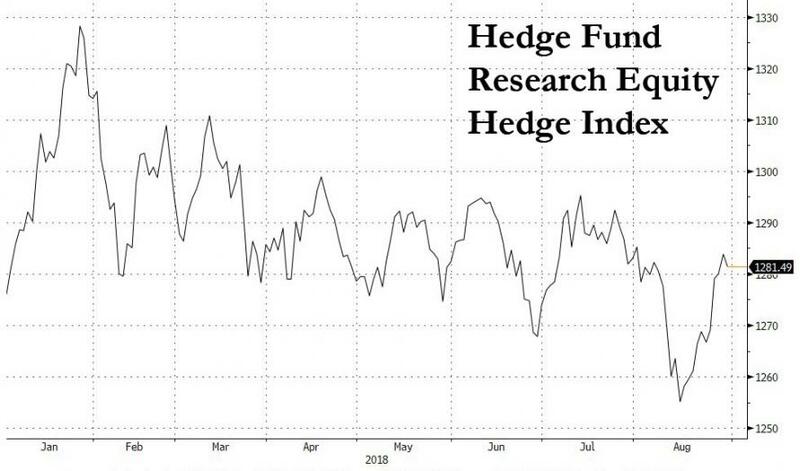 This has helped the Hedge Fund HFRX Equity Hedge Index regain some ground in the second half of August, although even with the recent rebound the index is still barely changed YTD and sorely underperforming the S&P500. Last, but perhaps most important, is McElligott's observation that September has a distinct calendar pattern to it, with equities set-up for a "rally in front half of month, sell off in back half", as shown in the chart below. Funds “forced-into” the melt-up at start of month / +++ historic for the first two weeks, just before post-expiry dealer gamma comes off and the “buyback blackout” picks-up for many of the largest S&P sectors. This is what the seasonal performance for September has looked like over the period 1994-2017.